Beware! | Of the place for the good life in Bavaria. Of the place for the good life in Bavaria. 10 Reasons not to apply for a new job here. YOU MIGHT BECOME TOO SUCCESSFUL. We are home to global players like Siemens, Adidas and many more, as well as approximately 150 hidden champions practicing a different kind of corporate culture. Tons of exciting job vacancies in big – as well as small and medium-sized companies – are actively looking for natural talents to pursue their career. It’s going to be hard to choose from. YOU MIGHT HAVE TOO MANY LEISURE OPPORTUNITIES. No other region in Germany offers such a varied mix of nature parks, attractive towns and cities, cultural landscapes and world-famous monuments. Outdoor activities such as climbing, cycling, hiking and festivals like “Rock im Park” or the Bayreuth Festival make sure that there is always something exciting to do next. YOU MIGHT LIKE THE FOOD HERE WAY TOO MUCH. The culinary similarities between Poland and the Nuremberg Metropolitan Region are pretty impressive. Nürnberger Rostbratwürste might not be a match for Krakowskas, but you won’t find a better sausage outside Poland. Our Nürnberger Lebkuchen will remind you of Torunskie Piernikis. And many more things are strongly reminiscent of the taste of home. And who wouldn’t want that? YOU MIGHT SEE YOUR FAMILY FAR TOO OFTEN. Poland is easily reachable by car or plane. There are daily flights to Warsaw from Nuremberg’s Albrecht Dürer Airport, so you can get back home in almost no time. No excuse not to visit anymore. THIS REGION MIGHT BE TOO INNOVATIVE FOR YOU. We never stop inventing. As an “innovation leader” we are one of Europe’s most active players. Our companies and research facilities are global leaders in intelligent mobility, digital healthcare, energy systems and more. Our “Medical Valley” has been selected as Germany’s digital health hub, whilst Fraunhofer IIS is the largest Fraunhofer unit globally. YOU MIGHT MAKE TOO MANY FRIENDS. 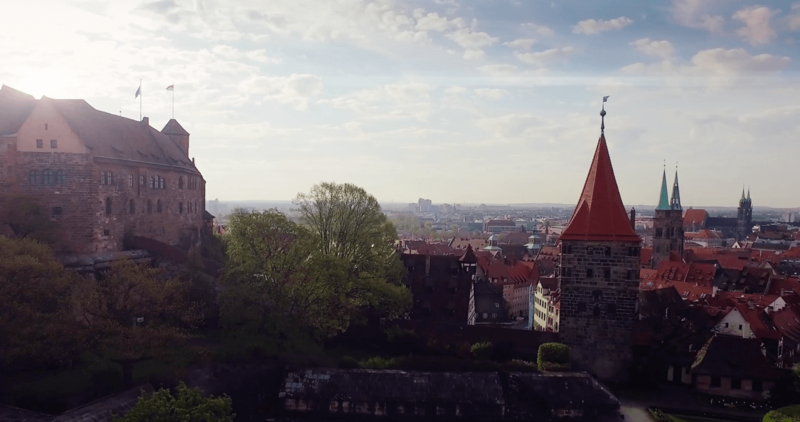 The Nuremberg Metropolitan Region represents open-mindedness and tolerance. That’s why people from more than 160 countries live and work here. Connecting with like-minded people has never been easier. The International Human Rights Award for the city of Nuremberg is the best proof that we love and live diversity. And just in case you’re missing home – there’s a big Polish Community here as well. THE QUALITY OF LIFE MIGHT BE TOO HIGH FOR YOU. 96% of all citizens agree. It’s a damn good place to live here. That’s also because you won’t waste time worrying about health issues – you’ll receive fully paid sick leave and can expect up to 30 days holiday a year. Not much to complain about. Sorry. YOU MIGHT HAVE TOO MANY BREWERIES TO CHOOSE FROM. With 300 breweries, the Nuremberg Metropolitan Region has the highest brewery density in the world. It’s very likely that you will discover a new draft that beats everything you’ve tasted before. YOU MIGHT HAVE TOO MUCH MONEY LEFT EACH MONTH. The living cost ratio is extremely good here. Compared to London, the average rent is around three times lower – with wages well above average. YOUR KIDS MIGHT OUTSMART YOU WAY TOO EASILY. With over 20 universities and higher education institutions, we are prepared to offer the next generations the best academic systems and dual education trainings possible. And because we know that excellence starts at an early age, we also offer outstanding childcare options for every age. There are way too many job vacancies to choose from. Are you interested in a position here for the good life in Bavaria? Get in touch with us and apply now. The Federal Employment Agency offers an International Placement Service for those who are thinking about working in Germany. The service assists in making the correct decisions while preparing for a future stay in Germany, offers comprehensive information on working and living in Germany, and helps you to find a job.